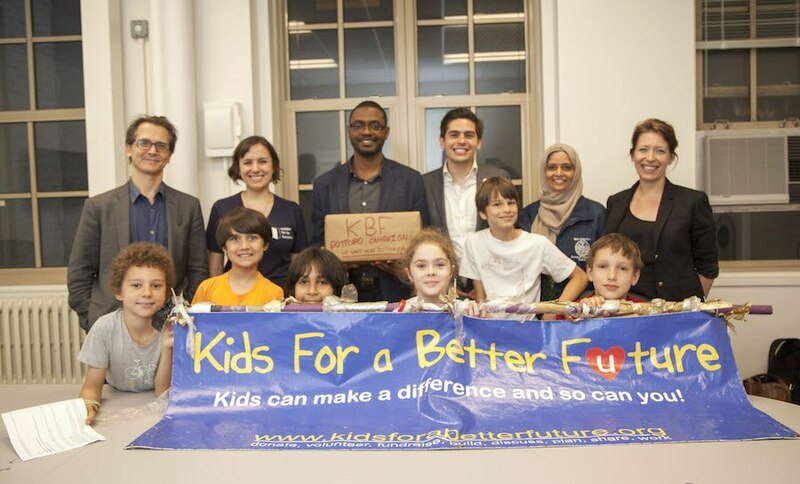 For the past 10 months, an NYC student group called Kids for a Better Future (KBF) has been working with the Coalition on projects to better the lives of homeless men, women and children, and raise funds for the Coalition’s programs. 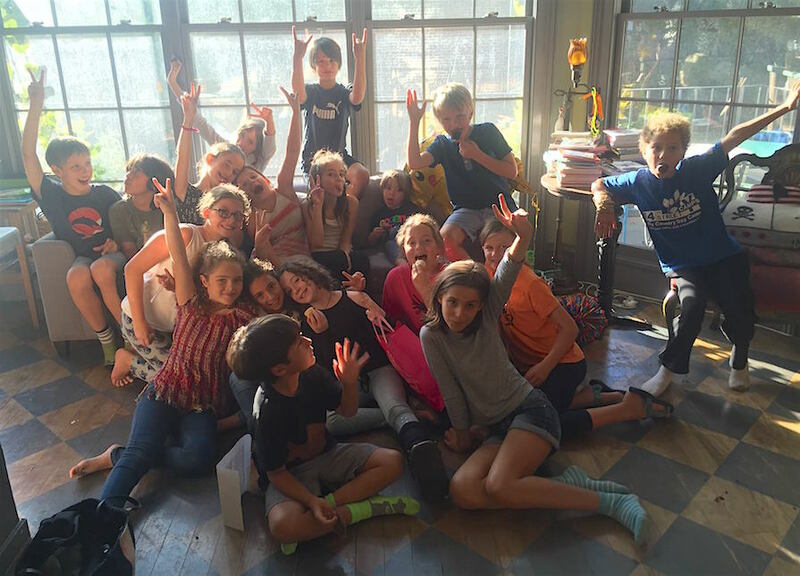 Each school year, the fourth graders in KBF focus their service and advocacy efforts on a different cause and nonprofit. This year, the group chose to partner with the Coalition because the kids felt so strongly about wanting to help the homeless people they see on the streets every day and the thousands of kids sleeping in shelters. Their year of service kicked off in September with an info session run by Coalition Policy Analyst Jacquie Simone. Jacquie taught KBF members about the 3,500 people the Coalition serves every day and shared common facts and myths about homelessness. They also brainstormed about actions the kids could take to help during their service year. Ready to kick off the 2016-17 service year with the Coalition for the Homeless! The KBF members hit the ground running! Over the next few months, they collected food, blankets, and warm clothes for homeless families, worked in a soup kitchen and made and distributed sandwiches to homeless adults living on the streets. They also ran their own drive to collect toys as part of the Coalition’s Holiday Toy Drive. 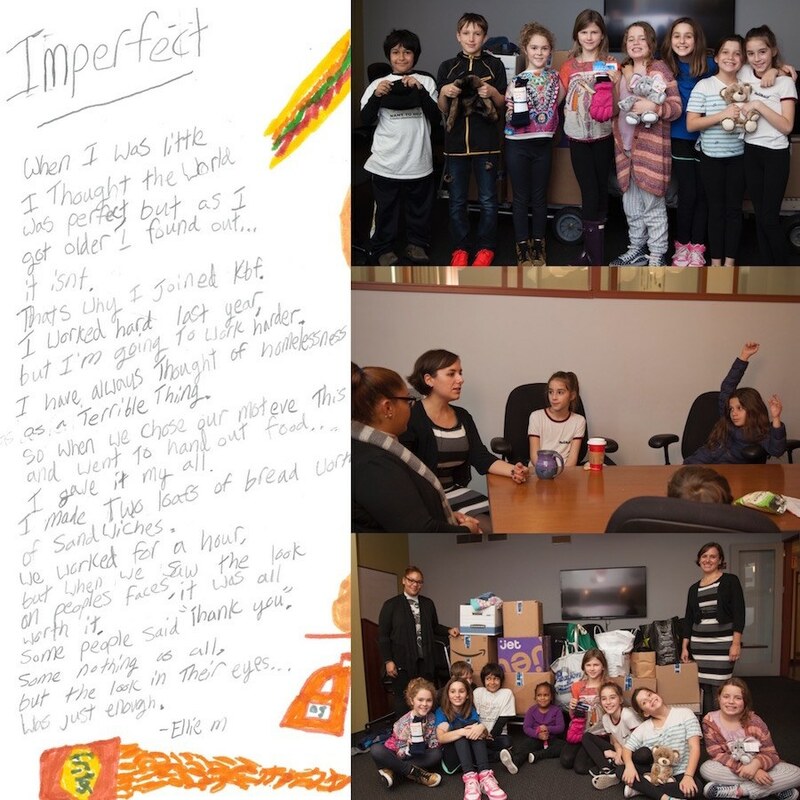 In December, they delivered all of these wonderful items to the Coalition’s offices along with notes and reflections on what they had learned during their fall service projects. The kids and their parents also got to sit down with Coalition Development Associate Zuheilly to hear first-hand accounts about what it was like to live in a homeless shelter. This made the kids even more determined to support homeless families in any way possible. When two small children were killed in a tragic accident in a cluster-site shelter later that month, the KBF kids immediately reached out to ask how they could help and sent heartfelt condolence letters to the bereaved parents. Throughout the winter, KBF was all about raising awareness and funds. They organized a year-end fundraising campaign and in March, hosted a screening of the Emmy Award-winning documentary The Homestretch at the Wythe Hotel in Brooklyn. The documentary details the story of three homeless teens in Chicago. 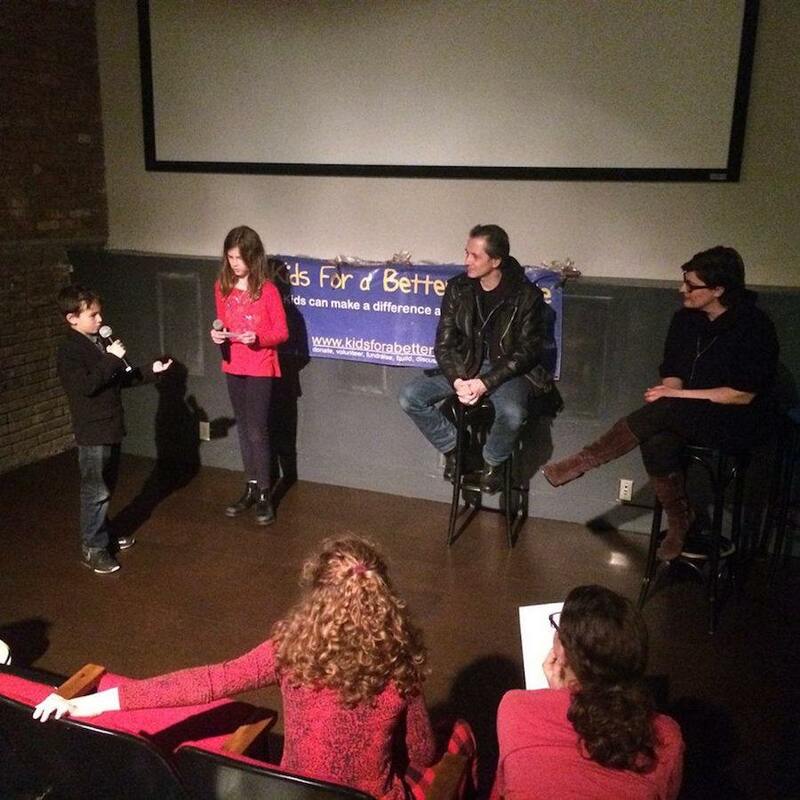 The screening also featured a Q & A with filmmaker Kirsten Kelly and CFH Executive Director Dave Giffen, where the kids and their parents were able to ask questions about the film, what it’s like for kids growing up in homeless shelters in NYC and how to best help the people who need it most. KBF members lead a Q&A with CFH Executive Director Dave Giffen and filmmaker Kirsten Kelly at the March screening of The Homestretch in Brooklyn. On May 6th, KBF held its 10th Annual KBF Walk-A-Thon. They created flyers and signs and even made appeal videos for their Facebook page and website. 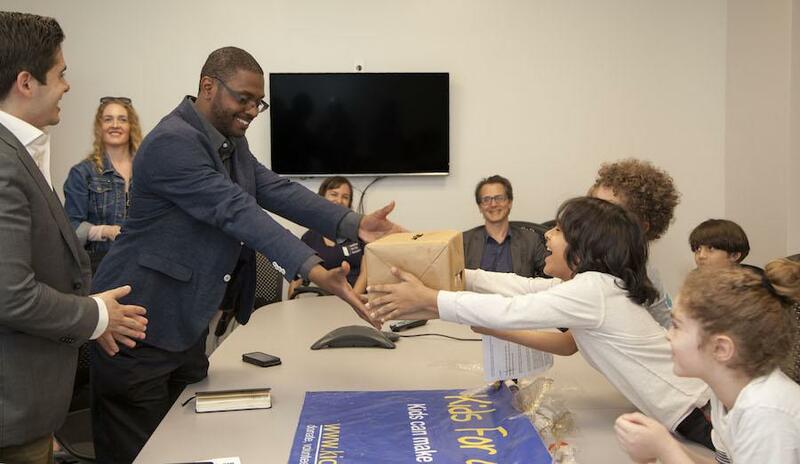 They reached out to all their friends, families, and classmates to tell them about all the hard work they had been doing on behalf of homeless New Yorkers through their partnership with the Coalition, and about why homelessness is such an important issue to them. Through their tireless efforts, KBF was able to raise nearly $20,000 for Coalition programs! 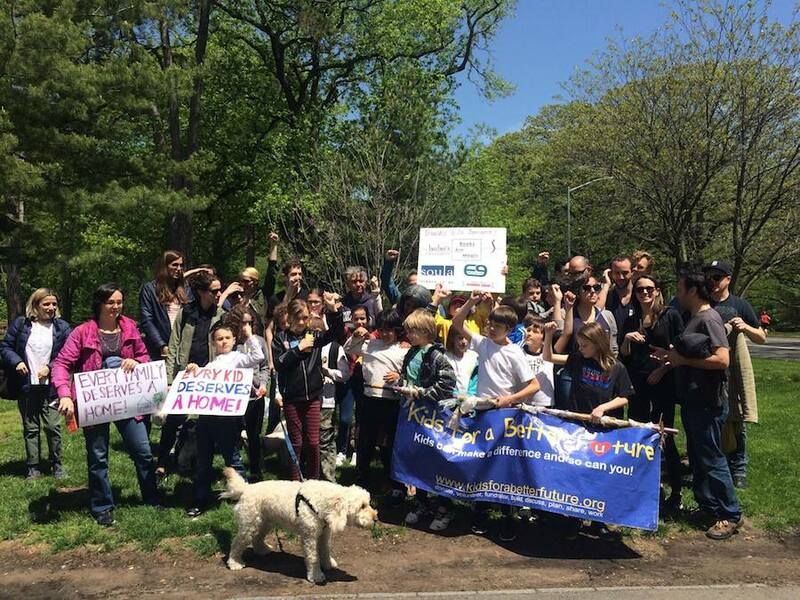 CFH staff members join the KBF kids and their families in Prospect Park on a beautiful spring day to raise awareness about homelessness in NYC – and to join in the inspiring chants the kids had created! We were honored to have KBF wrap up their year of service with the Coalition by holding a rally at City Hall on June 2nd to ask Mayor de Blasio to increase the number of NYCHA public housing placements for homeless families from 1,500 per year to at least 3,000 per year. KBF members each took a turn at the podium to talk about why helping the Coalition has been so important to him or her, and why the Mayor needs to help more homeless families and their children move out of shelters and into permanent public housing. Coalition staff and supporters join the KBF kids in chanting to urge the Mayor to increase public housing placements for homeless families. After the rally, the young activists marched to a meeting with representatives from the Mayor’s Office of Community Affairs. KBF kids spoke eloquently at the meeting about their experiences from the service year and reiterated their call for more public housing for homeless families. They also delivered 1,300 signed postcards urging the Mayor to increase the number of public housing placements for homeless families from 1,500 to 3,000. KBF members had collected signatures on 1,000 of these petition postcards from their classmates and friends, and other student groups elsewhere in the city added to the impressive total. The Mayor’s representatives said they were amazed and encouraged by the KBF kids’ dedication to this important issue. Delivering 1,300 postcards signed by NYC kids asking Mayor de Blasio to house more homeless families. 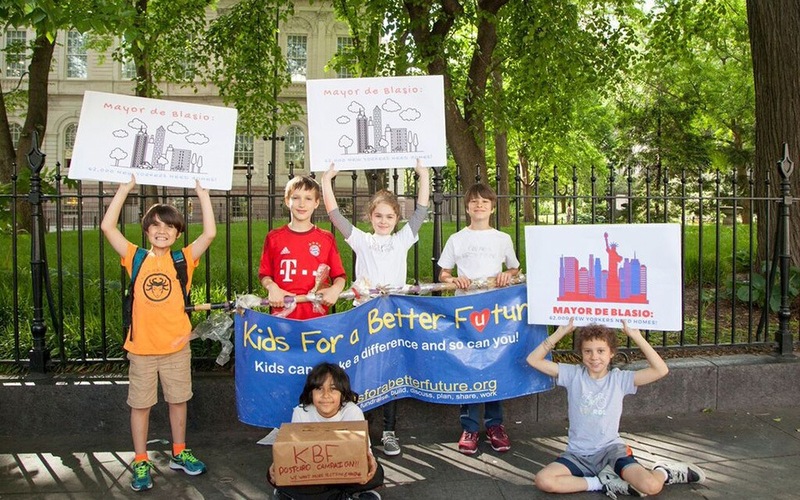 We cannot begin to sufficiently thank the inspiring kids of KBF, parents Sunita Shaw and Lisa Heller, and all of the supporters, friends and other family members for their tireless efforts and boundless support throughout this past year. If your class or student group is interested in working with the Coalition, please email info@cfthomeless.org for more information or to request our student petition postcards to send to the Mayor. You can also sign our online petition for more NYCHA placements for homeless families here. The post Thank You, Kids for a Better Future! appeared first on Coalition For The Homeless.